Bulk purchases may re-sell or re-label product to your specification. Please be sure to include all relevant and important safety precautions on label. Important labeling information will be included with purchase. **Please note-International customers. Shipping will be calculated and billed accordingly. Bulk orders of weft sealer will NOT fit in a flat rate envelope. To seal wefts/tracks of hair to reduce shedding: Apply a thin coat of sealer to the track of hair along the thread/track. Allow product to dry, coat both sides of weft. Apply a second coat of sealant. Product dries quickly and cures immediately upon drying. DO NOT use this product to bond wefts/tracks to natural hair. Water Resistant. Acetone resistance may vary per user. Shake well before using as the dye/pigment may settle over time. **Weft Sealer will help to reduce shedding. It will not stop all shedding 100%. 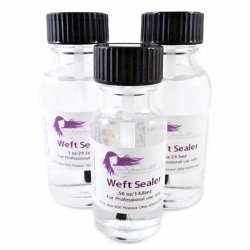 Using our weft sealant on a well constructed weft will significantly reduce shedding A poorly constructed weft or wefts with loose threading may still experience shedding beyond what any weft sealant product can prevent.